I mentioned in my last post that I’d been sick this week – a nasty sinus thing accompanied by cough and general tiredness. 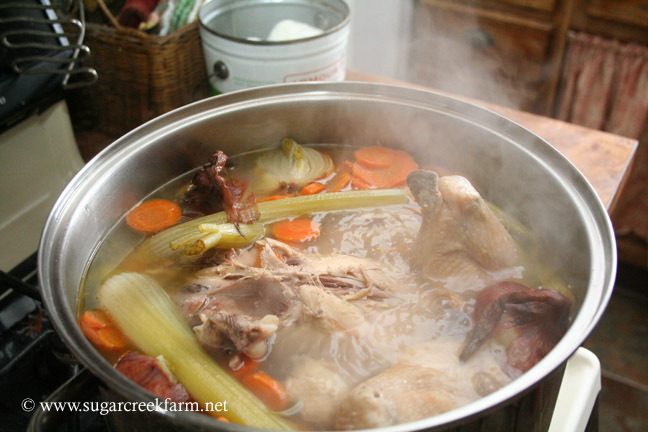 So I took the carcass from the chicken I roasted for Easter dinner and brewed up some broth. The perfect antidote for a case of the yucks. Feel better! I like how you backpost to past years – great idea! I think I’ve got what you’ve got. I’ve been feeling sick for several days now.Man! That soup looks so nourishing and pampering when one is sick.Wish I could cuddle up and have a bowl.